Did you know that 70% of Americans suffer from computer vision syndrome? CVS happens when you stare at the computer for too long. I discovered some valuable insight into this problem from Eye Care magazine published by HealthMonitor. This type of “near work” strains the muscles in your eyes that focus on near objects and you also tend to blink less, which can dry out eyes. Symptoms include blurry vision, headaches and strained, dry or tired eyes. According to eye specialists, there are five simple steps that can help alleviate this. 1. Follow the two-foot rule: sit about 25 inches away from your computer and tilt the screen to so you look down on your work. 2. Get rid of the glare: glare from overhead lighting and the sun can reflect off your screen…this contributes to eye strain. Dim the lights around your workspace and use shades or curtains to avoid direct light. You could also try an attachable anti-glare screen for your computer. 3. Take breaks: follow the 20-20-20 rule…every 20 minutes, look 20 feet across the room for at least 20 seconds. In this way you will be activating your distance vision. Blink often and take mini-breaks away from your desk. Close your eyes briefly and practice deep breathing which also helps relax the eye muscles. 4. Check your prescription: if you or your children wear glasses, make sure the prescription is up-to-date. Eyes do change and it is important to see your eye doctor on a yearly basis, especially if you wear glasses. If you or your children are having eye problems whether you wear glasses or not, please make an appointment…our eyes are so precious and they are not replaceable. 5. Moisturize: staring at a computer screen, especially in an air-conditioned room, can lead to dry eyes. Use artificial tears or a desktop humidifier and remember the 20-20-20 rule…look away and blink. Many of us do lots of close work and when you add up the time children spend reading books and doing homework assignments, playing or working on the computer or other electronic devices and watching TV, you’ll agree that it’s really important for them to follow these simple steps as well. 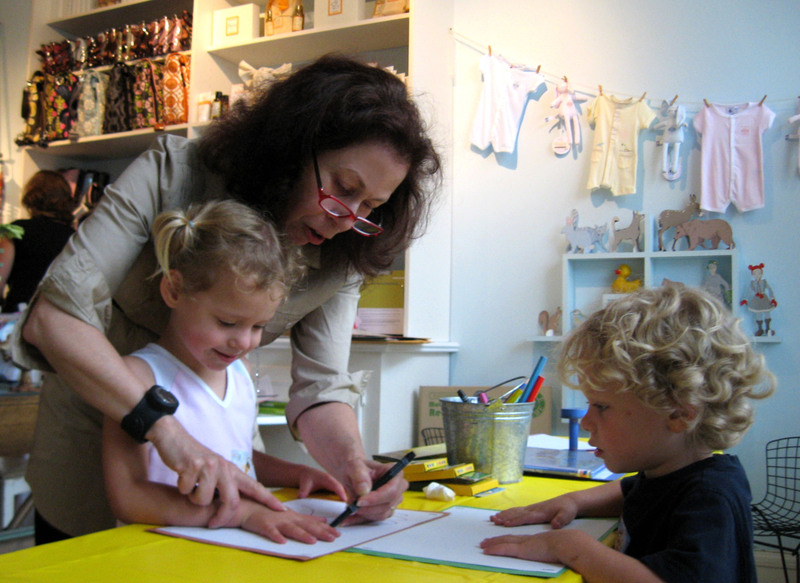 Now that school is starting, many preschoolers will be left at home without older brothers or sisters to play with them. If you’d like to provide great activities for your young child (other than sitting in front of a TV or computer monitor), please visit my websitewhere you can purchase a copy of Show Me How! 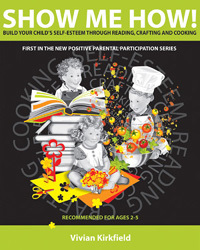 Build Your Child’s Self-Esteem Through Reading, Crafting and Cooking at 50% off the cover price. This award-winning resource for busy parents will provide you with 100 picture book story suggestions and summaries and gives you an eco-friendly craft activity and a child-friendly recipe for each recommended title…FRESH IDEAS FOR A NEW SCHOOL YEAR! BTW, it’s also available on Kindle! Are Electronics Hurting Your Child’s Eyes? Yesterday I had an eye doctor appointment. As I sat in the waiting room, I noticed a small magazine entitled “Eye Care”. It’s published by HealthMonitor.com and is packed full of valuable articles and information. I know that many parents wonder about any dangerous effects that electronics…and their children’s use of things like mobile phones, iPads, 3-D handheld video games and laptops…might have. Are electronics dangerous to your child’s eyes? There are no studies showing permanent or long-lasting visual damage from these types of devices. 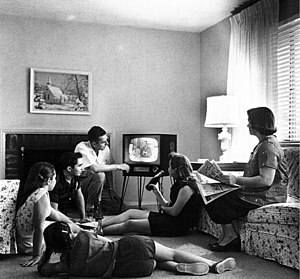 But are there any temporary problems that can crop up from staring at portable game devices, surfing online or watching TV for prolonged periods of time? The answer to this is YES! Strain, fatigue and dry or scratchy eyes can result from doing anything up close where our eyes are doing too many things: focusing, coordinating and moving close together…this can cause the eye muscles to get tired. What can parents do to help avoid this? Put a daily time limit on electronic devices. 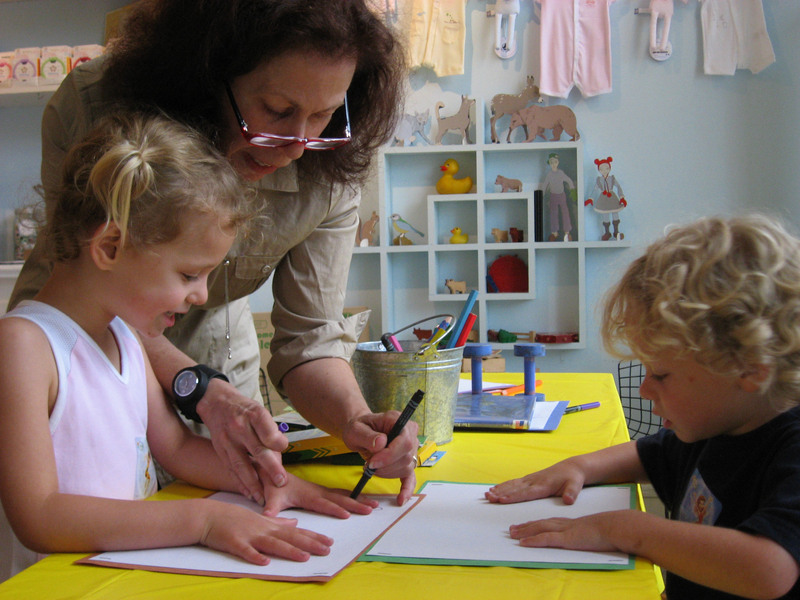 Remind your child to get up frequently while engaged in a task or game. Encourage your child to participate in outdoor activities or sports each day. Use time playing video games or going on the computer as a reward for completing homework…that will insure that eyes are tired out before homework is done. Tomorrow I’m going to share: 5 Ways to Treat Screen Strain…for all of you out there who blog. 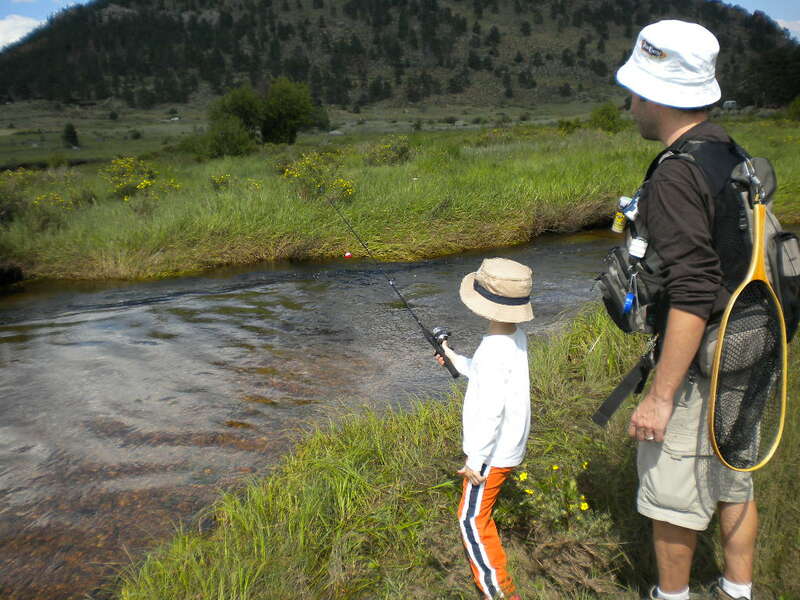 TAKE A KID FLY-FISHING – POSITIVE PARENTAL PARTICIPATION IN ACTION! 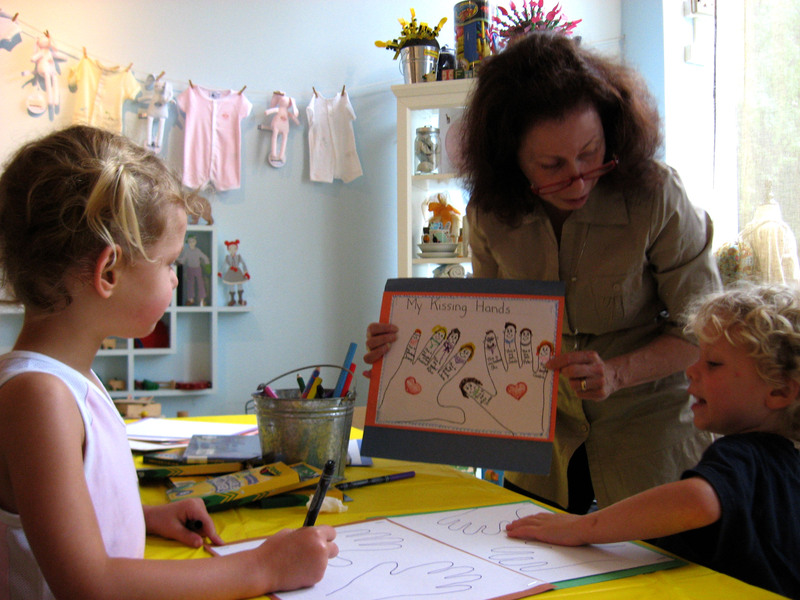 I have a passion for using picture books and positive parental participation to help build self-confidence and create a life-long parent-child bond. 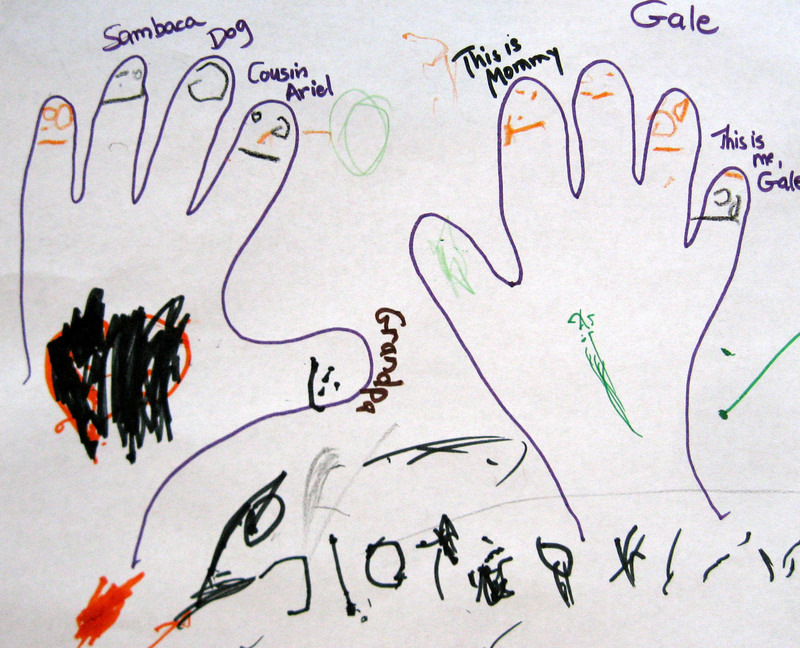 So I’m always thrilled when I find a book that encourages parent and child to participate together. Thanks to Kirk Werner, parents have not one, but a series of THREE amazing books that can be enjoyed by children from preschool to puberty and beyond! Olive, the Little Woolly Bugger is the first book in this series by author and illustrator, Kirk Werner. 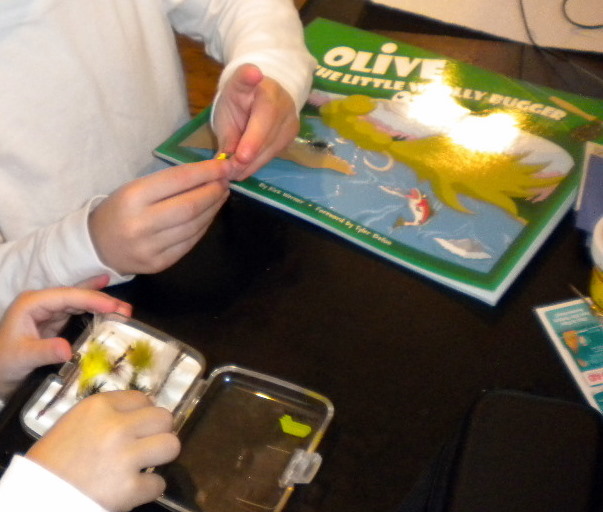 It details the experiences of Olive, a woolly bugger fly used in fly-fishing. Olive attends Camp Tightloops to learn how to become a fishing fly and meets many other flies…some who are bullies and snobs and others who are friendly and helpful. 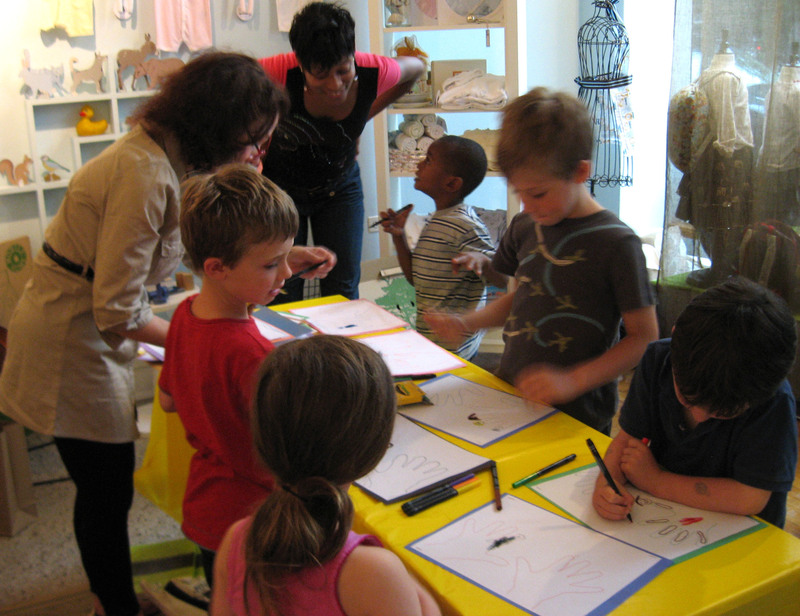 Children of all ages will connect and identify with the engaging characters. According to Kirk, “On the surface, my fly fishing book series for kids may just appear to be children’s stories set against the backdrop of fly fishing. While true, there’s much more to them than that. The intent of my books is to introduce kids to fly fishing through a series of fun stories that are both educational and entertaining. For kids lucky enough to hail from an angling family, no encouragement is needed to get them outdoors with a fly rod in hand. But kids who may not have the guidance of an adult angler in their lives are really the ones who stand to gain the most from my books. In other words, my books are for all kids (and frankly, for adults as well). 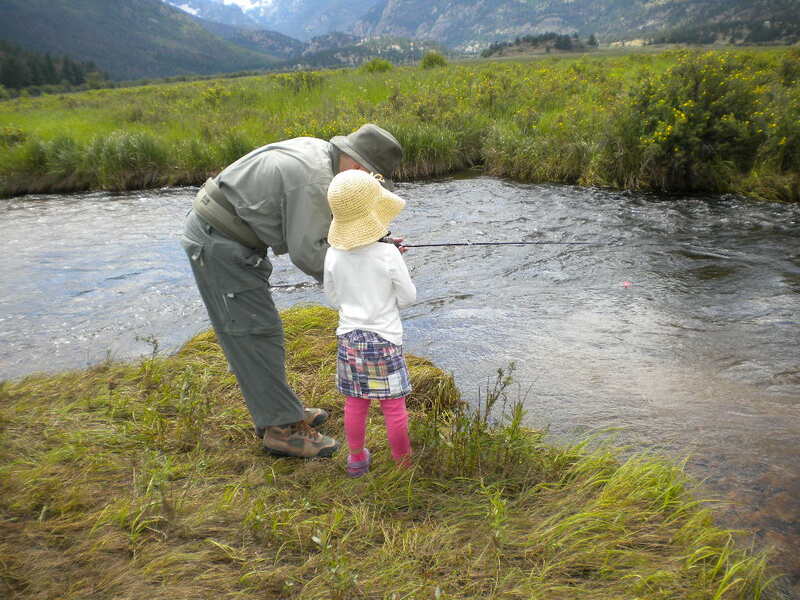 But the goal of my books is also bigger than just fly fishing – it’s about getting kids outdoors. As I mentioned in a previous blog entry, according to a study by the Outdoor Foundation fishing is the #1 “Gateway Activity” to launching kids into many other outdoor pursuits such as camping, hiking, boating, etc. All are excellent ways to get kids away from their video games, off the couch and into the great outdoors for some good, old-fashioned recreation. Choosing the right fly. How about Olive, the LIttle Woolly Bugger? 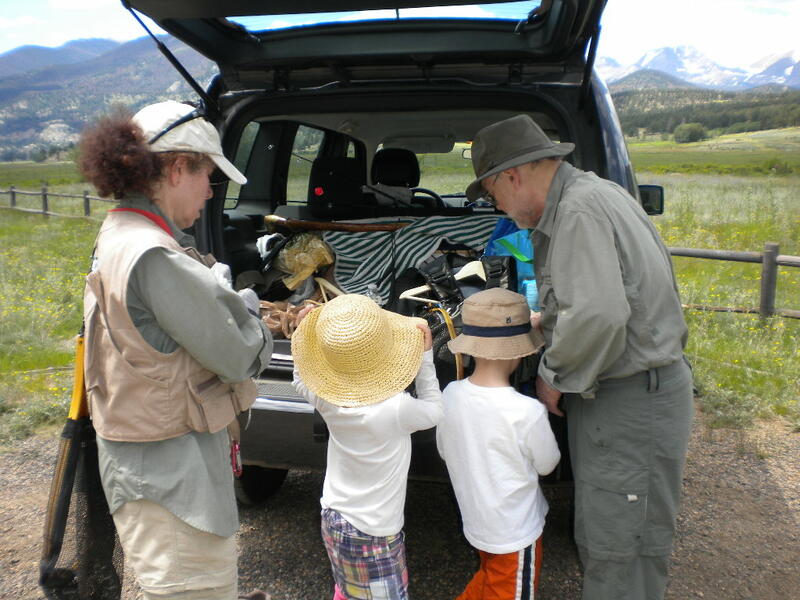 Our time with our grandchildren and son and daughter-in-law at Rocky Mountain National Park was, to say the least, fantastic! The day was perfect…amazingly there were no thunderstorms to hamper our enjoyment. The children took to fishing as if they had been doing it for years. The first fly they wanted to try was…you guessed it…a woolly bugger! And, even though my book is about reading, crafting and cooking, I’m always encouraging parents to get outside with their children, whether it is to take a walk, go on a nature hike or spend time at a park or playground. There is so much more I’d like to share with you about this wonderful author and his Olive series. My next post will explore the organizations he supports with a portion of the proceeds of book sales and a little bit about the other two books he has written. 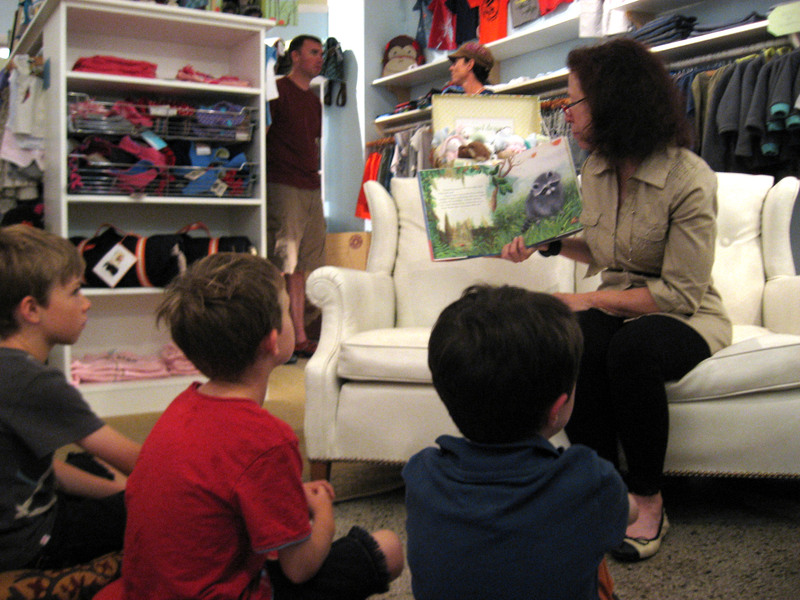 I’d also like to invite parents, grandparents and anyone who is caring for little ones to a Show-Me-How Story-time with Miss Vivian this Saturday, August 6th from 11am to 1:30pm at Family Christian Store, 7560 N. Academy Blvd in Colorado Springs. If you are local to Colorado Springs, please stop by for one of the STARTING SCHOOL JITTERS BE GONE! presentations…at 11:30am-12 or 12:30pm to 1. We’ll be talking about school anxiety, reading a wonderful picture book story and then doing a fun craft project. 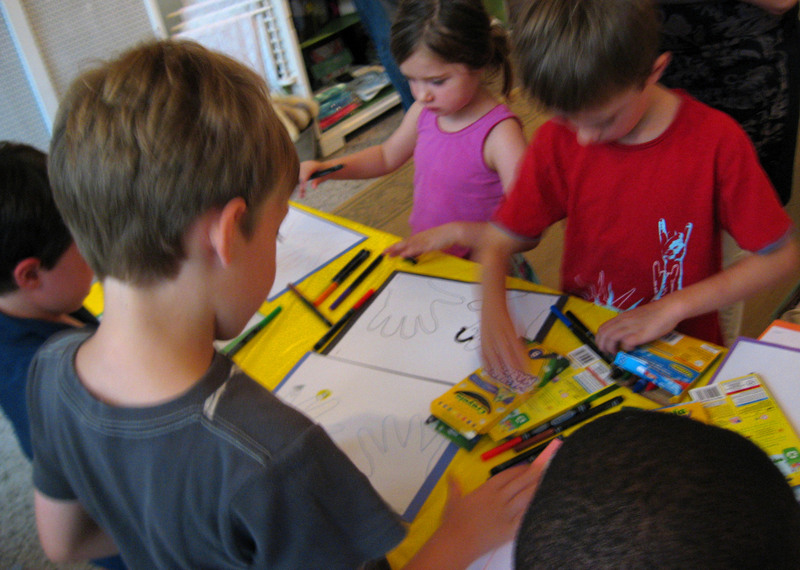 There will be a free hand-out for parents on Five Steps to a Smoother School Year and parents can fill in an entry form to win a bunch of craft supplies for their child. Please email me at vivan@positiveparentalparticipation.com or call the store at 719-598-1500 if you have any questions.